Members of the Night Wolves, a Russian biker club, traveling to Berlin to mark the 70th anniversary of the defeat of fascism, have crossed the border into the European Union, despite threats to stop their entry. 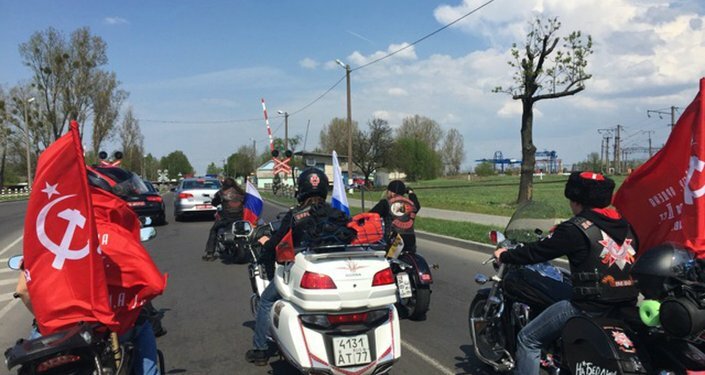 A journey which started in Moscow on Saturday April 25 has continued into the European Union, the Night Wolves group of bikers announced on Thursday, some of whom made their way onto EU territory on Thursday despite attempts from the authorities to prevent their passage. "In spite of the orders given at all the border posts 'don't let in the Night Wolves,' we have managed to cross the border!" announced the group on its blog, communicating a message from the biker group's leader, Alexander "Surgeon" Zaldostanov. "Now the guys are traveling on their planned route. Destination – Bratislava. There they are going to meet with bikers from the Balkan Peninsula," wrote the group, in a message posted in the early hours of April 30. In this post to their Facebook page, the bikers announce the 'Breaking News' about their border crossing. The blog post indicated that the bikers had crossed into Europe at 23.00 on April 29, but did not say exactly where the crossing had occurred. In a previous blog message, dated 17.30 on April 29, the bikers updated their location to Privalka, a border crossing between Belarus and Lithuania, but reported that they had been refused entry by border guards, who told the bikers that orders had been given to guards at all border crossings not to let the group through. A Night Wolves representative told a Moscow radio station on Thursday that some Night Wolves had reached the Czech Republic: "A group of our bikers are in Ostrava, so we're planning an event together with the consulate in honor of the 70th anniversary of the liberation of Ostrava," said Andrey Bobrovskiy. On Monday it was reported that several hundred bikers from the Night Wolves club had been denied entry to Poland in the town of Terespol, on the border with Belarus, after which Russia's Foreign Ministry made an official complaint to the Polish government about the "unreasonable and provocative" measure, which they considered "an insult to the memory of those who fell for the liberation of Europe from fascism." Earlier this week, Zaldostanov reiterated that the bikers were determined to see through their journey to commemorate the defeat of fascism, and explained the origin of the rally's route through Europe, the idea for which was first formed in 2006 after a meeting with late World War Two veteran Nadezhda Kirillova. Kirillova, said Zaldostanov, was a motorcyclist who took part in the war on an M-72 motorcycle and was the only remaining veteran able to recall the places in Europe where her fellow soldiers were buried. "We didn't want to create a big fuss, but we wanted to travel along the same route," explained Zaldostanov, promising that one way or another, the Night Wolves will make it to Berlin for the May 9 commemoration.